What could be the harm? After several hours of intense pressure, you might emerge as the new owner of a timeshare, and just like someone who wakes up after a bender with a new tattoo, have no idea why you agreed to it. Rick Pons understands. 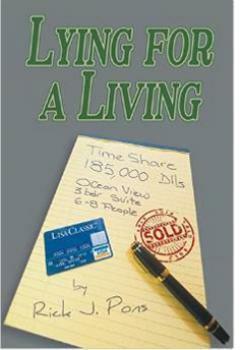 He's just published a book, “Lying For A Living,” in which he lays out what he says are some of the seedier aspects of the way some timeshare companies operate. Pons says he was recruited into timeshare sales in 2003 in Cancun, Mexico – a competitive venue for the timeshare business. His book recounts his experiences as he got deeper into the business, until he finally became disillusioned and quit. Pons describes the life of a timeshare salesperson as consumed with “fear of rejection, the moral dilemmas, the harsh work conditions, the constant backstabbing” from everyone around you. “It´s really not a job for everybody,” he said, in something of an understatement. Pon describes the timeshare sale as an emotional process in which the sales team works hard to get the prospect – usually a couple – to like and trust them. If you have to lie to build the right rapport, well – you lie. In his book Pon diagrams a typical hard-sell timeshare operation. It starts with a person called the “liner,” who often is the first to make contact with the target. The information is passed along up the ladder to other team members until it reaches the closer. This is where the rubber meets the road. Pon makes clear that he is not painting all timeshare operators with the same brush. While owning a timeshare probably makes no sense for the vast majority of people who end up buying one, Pons insists there are people for whom they do make sense. “There are some good deals out there, if You know how to get them,” Pons said. “Just like in any other industry there are good ones and bad ones. The bad ones, he says, will lie – about almost everything. Pons says they even lie about whether or not they are a timeshare, which he says has now become such a loaded term that no one likes to use it anymore. Instead, they may be called "vacation clubs," "all inclusive clubs" or "fractional ownership clubs." Pons believes the timeshare industry, after some 40 years, is being forced to evolve. With competition from newer, higher quality resorts, the worst players are dropping by the wayside. Still, when you're on vacation, better keep your guard up. “Timeshares sell dreams, the dream of a perfect family vacation and in most cases they do it when the families are in relax mode, when people are on a vacation and their defenses are down,” Pons said.